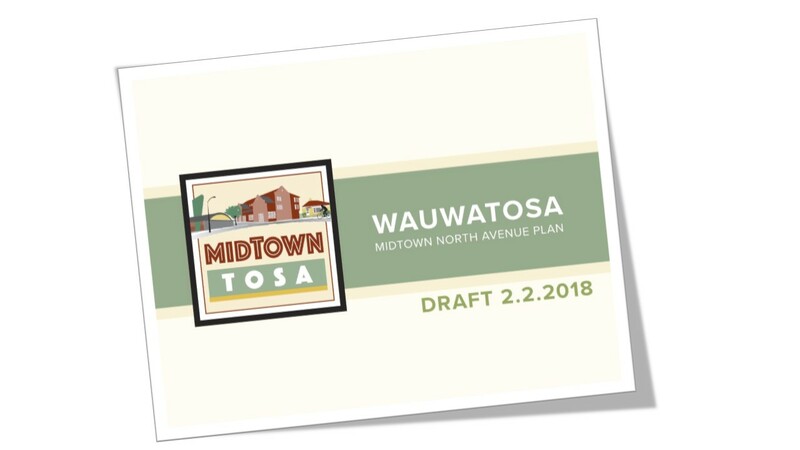 MidTown Tosa Strategic Master Plan – MidTown Tosa is the premier destination in central Wauwatosa, offering exceptional products and services to our desirable neighborhood and beyond. Download a copy of the first draft of the Midtown North Avenue Plan. Thank you for your continued interest! The plan will be discussed at the Plan Commission Meeting on Monday, February 12th. The meeting begins at 7pm and the MidTown Plan is Item #5 on the agenda. Please share your comments with Jen Ferguson, Economic Development Manager at jferguson@wauwatosa.net. Thank you for attending the Open House and providing your feedback. If you attended or missed the event, you can take a closer look at the boards by downloading a copy of the displays. These are simply concepts, ideas of possibilities for the future. We want your feedback. E-mail Jen at City Hall at jferguson@wauwatosa.net. (January 2018) Note: Feedback from public meetings has resulted in changes since the open house. Open House on Wednesday, November 8th from 5pm to 7pm. 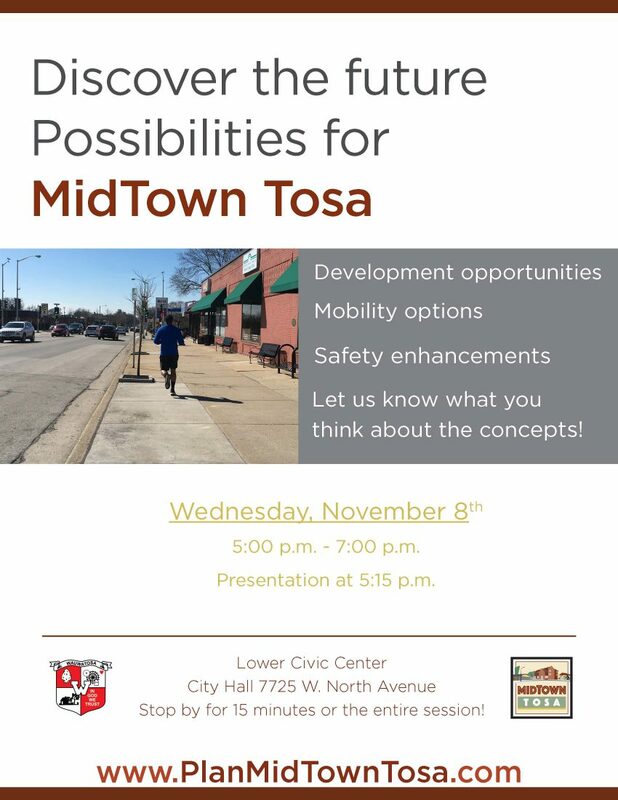 The city will host a public open house of the MidTown Tosa Strategic Master Plan on Wednesday, November 8th. Everyone is invited. Doors open at 5:00 pm for people to tour displays. A short presentation will begin at 5:15PM. Come and go as you like. When: Wednesday, November 8th from 5pm to 7pm. Presentation at 5:15pm. The Steering Committee met on September 18 to continue refining the concepts for the MidTown Plan. The committee scheduled an Open House event on November 8th. In the meantime, the project team will advance the concepts with new illustrations and narrative. We look forward to sharing the results at the Open House, and receiving your feedback. The steering committee met on July 19th to discuss the emerging concepts for MidTown. Throughout August, the design team will continue to refine the concepts based on feedback. Updated concepts will be shared with committee members in September for further review. A draft of the plan and its concepts are expected to be available for everyone's review at a Public Open House on October 25th. Stay tuned! Thank you to everyone who participated in the design studio on May 17th. We received lots of great input! The project team was also fortunate to attend the First Midtown Annual Meeting on May 18th, and had an opportunity to introduce the project. Before wrapping up the design studio, we were able to visit with many of you on May 19th to discuss concepts and illustrations for the future of MidTown. What’s next? The project team will continue to refine the concepts and explore new possibilities before returning in July to visit with the Steering Committee. Concepts will be slowly released starting in late-July until our Open House in August. 3. Check out the schedule for future public events...next up is the interactive design studio on May 17th - 19th. 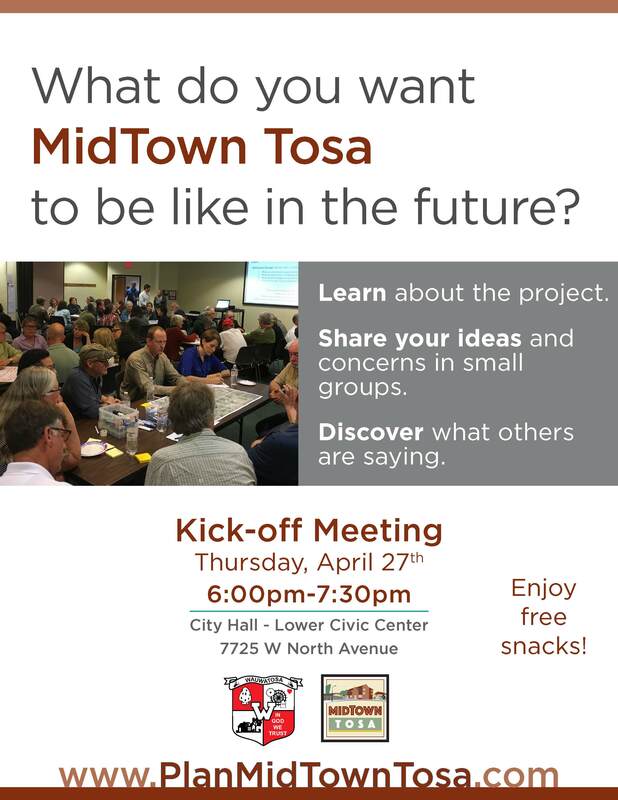 MidTown Tosa is creating a Strategic Master Plan to guide the future of the district and needs your help - whether you work, visit, or just travel through MidTown Tosa, we want to hear from you! You are invited to attend a kick-off meeting on April 27th. Learn about the planning process and share your ideas about challenges and opportunities, current conditions, and desired improvements to make downtown an better place to visit, live, work, and play. The event includes a short presentation at 6pm, followed by small-group discussion. We want to hear from you! 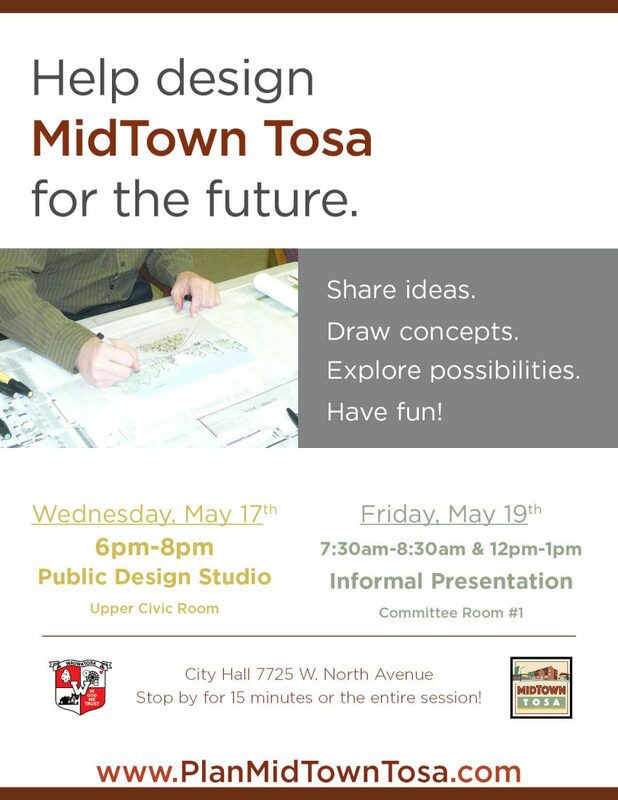 Please help us understand the opportunities and challenges facing the MidTown Tosa district by taking a short survey. The survey is just one more way to provide your input throughout the Strategic Master Planning process. Simply click the link below to begin!